Education at Springfield College is all about taking action. Springfield College is the first choice of 75% of its first-year students. There are 2,228 undergraduate students, 1,018 graduate students, and 1,000 School of Professional and Continuing Studies students at Springfield College. Students come from 33 states and 21 countries, mostly from the northeastern corridor of the United States. More than 87% of first-year students on the main campus return as sophomores, and 69% of them complete their degrees within four years, which is above the national average. Most students live on campus (85%), with 95% of first-year students residing on campus. There are 211 full-time faculty members, 85% of whom have earned the highest degree in their field. Faculty members make the time so that students make the grade. They provide close personal attention with a student-faculty ratio of 15:1. More than 50 opportunities for student involvement include academic-interest clubs, special-interest clubs, special-event clubs, honor societies, campus publications and media outlets, performing arts, and more. 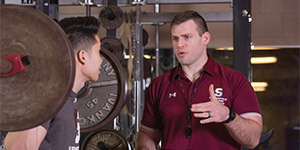 Springfield College offers 26 varsity sports for men and women, seven club sports, and extensive intramurals. The College competes in NCAA Division III and is a member of the Eastern College Athletic Conference and the New England Women’s and Men’s Conference. A total of 96% of recent Springfield College students found employment or enrolled in graduate school within six months of graduating. The Career Center offers students assistance and guidance throughout their academic experience so they have résumés prepared and interview skills developed when they graduate. Forming a network around the world, more than 45,000 Springfield College graduates live in most US states and many countries. Alumni events around the nation keep graduates connected to the College and each other. 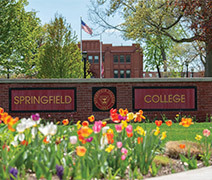 Undergraduate tuition at the main campus of Springfield is $36,920; room and board is $12,550. One hundred percent of undergraduates receive some form of financial aid. On average, the Springfield College financial aid package is $28,400, which accounts for scholarships, grants, and loans. After the package is applied, the average cost—based on tuition, fees, and standard room and board—is $21,595. Some aid packages may be more or less than this amount. 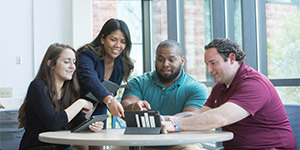 With an international reputation for educating tomorrow’s leaders in some of the most vital career fields, Springfield College provides students with a competitive edge—top-quality academic preparation and real-world experience on their résumés before graduating. As early as their first year on campus, students put their classroom education to practice through field work and service learning. It’s a learning advantage based on the College’s historic mission, the Humanics philosophy, which calls for educating students in spirit, mind, and body for leadership in service to others. Humanics is at the base of everything the College does—in academics, athletics, and student life. Springfield College has a welcoming community on its midsized campus, where transfer students quickly become engaged in academic and campus life. Credits from other accredited colleges and universities transfer easily, and financial aid is available based on need and/or merit. Students are never a number at Springfield College, and they receive individual attention from expert faculty members. With approximately 100 students transferring to Springfield College annually, there are programs designed to assist transfer students with making a seamless transition, both academically and socially. Programs include Transfer Summer Orientation as well as a four-day New Student Orientation program, where students discuss the ins and outs of the transfer experience and connect with other transfer students. Springfield College is located in a picturesque New England setting on about 100 acres in the Pioneer Valley. It’s an easy drive to Boston or New York City, and just down the road, students can experience East Campus, 57 acres of forest ecosystem that sits on a mile of lake shoreline and houses ropes courses, canoes, kayaks, and a camping facility. The College has 10 residence halls that offer coeducational living, as well as relatively independent living for upperclassmen. There are several dining and snack services, and the main dining facility offers an excellent variety of creative, fresh food stations to accommodate individual dietary preferences. The campus has wireless internet access, smart classrooms, and computer labs. In addition, a television studio lab, journalism lab, and fully functioning radio station are located on campus. Other facilities include a human anatomy lab, a performance assessment lab, an art gallery, an exercise physiology/biomechanics lab, a theater, and a medical simulation lab, featuring high-fidelity 3G adult and baby patient simulator mannequins that respond to treatment as human patients would. Extensive athletic and recreational facilities include the Field House and Wellness and Recreation Center, which house strength and conditioning facilities; a six-lane running track; multipurpose courts; a six-lane, 50-meter pool; and classrooms and laboratories.